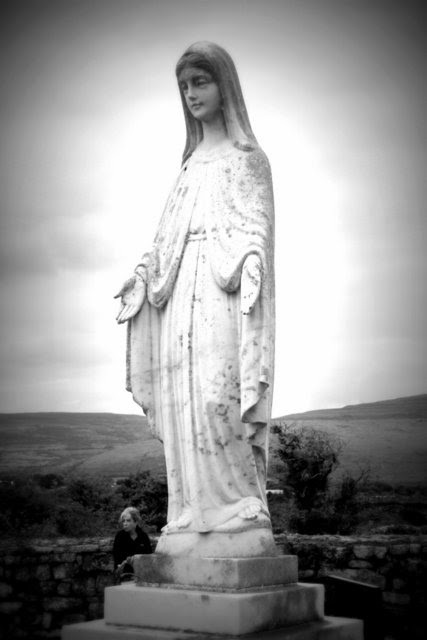 Playing with my photos today in black and white and a lomo-ish application.I think it's interesting how the effect makes Mary appear to glow. I took this photo during my visit to Ireland at the ruins of the Corcomroe Abbey in County Clare. The 13th-century Cistercian monastery was a favorite place of priest/poet/philosopher John O'Donahue who would perform Easter sunrise services here before his untimely death in 2008. In contrast to most of the monastic ruins I've visited, the cemetery at Corcomroe is still in active use. Our van driver, John's brother-in-law is buried here, overlooked by this lovely statue.